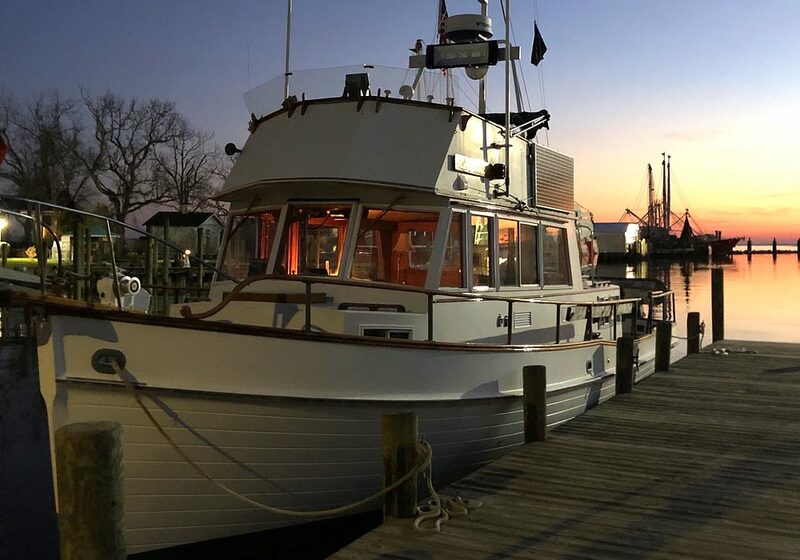 ea Glass, a 1981 Grand Banks trawler was odd enough – owned 36 years, only 2,000 hours on the engine, and in near perfect condition. But the most recent owner, Will Gardner, may be odder yet. Sea Glass in the evening at town dock #1. That was four years ago. Before then, Will lived outside of Asheville and was known locally as the owner of the Black Mountain Folk Music Festival. He made local news in 2008 when he broke up a knife fight on the side of the road, tending to one man’s injuries until help could arrive. Gardner, a veteran of the Vietnam War, was 56. 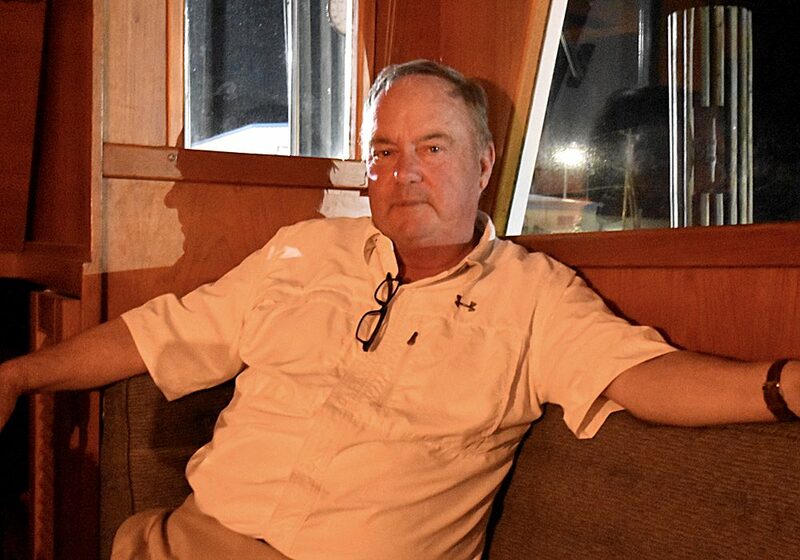 For the last four years, Will has lived alone on his trawler, traveling the rivers and the coast. Alone, that is, except for Reicher; a Schutzhund (German for protection dog) trained German Shepherd with a European Union passport. Will Garner talks to TownDock.net in the evening, after returning from Cape Lookout. “My life revolves around him,” Will said. Reicher doesn’t like being on the boat, and Will makes accommodations. They stop every 80 miles or so and take the Zodiac to shore so Reicher can stretch his feet. If the seas get rough, Will has medication to help. If the waves get too rough, Will and Reicher go ashore. “He’s the reason for breathing,” Will says. That devotion is why Will gave away his immersion suit. There was no need for it, he explained, because Reicher doesn’t have one. 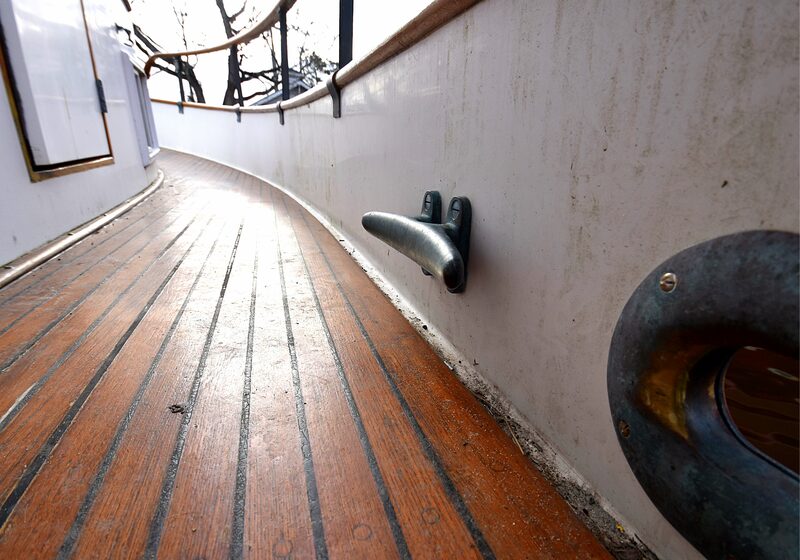 If something were to happen to the boat, Will wouldn’t be able to leave Reicher behind. 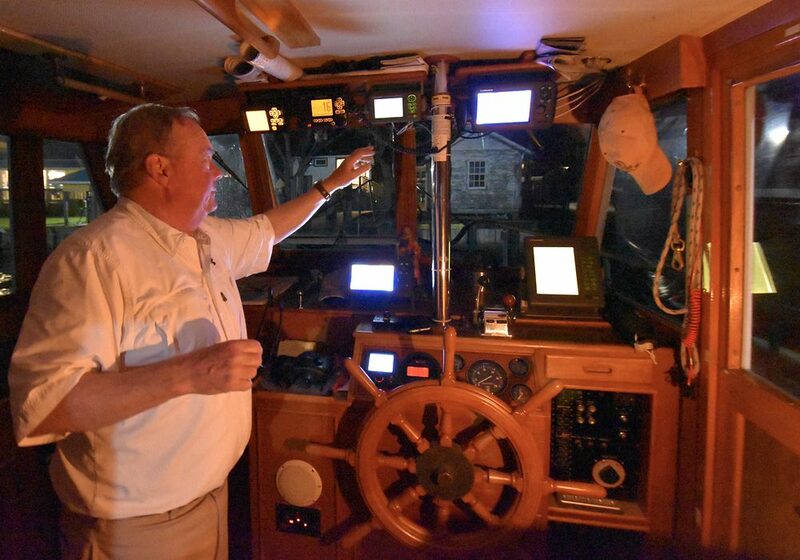 It’s why he made sure he understood the boat systems and navigations so thoroughly. He made his electronic systems redundant. 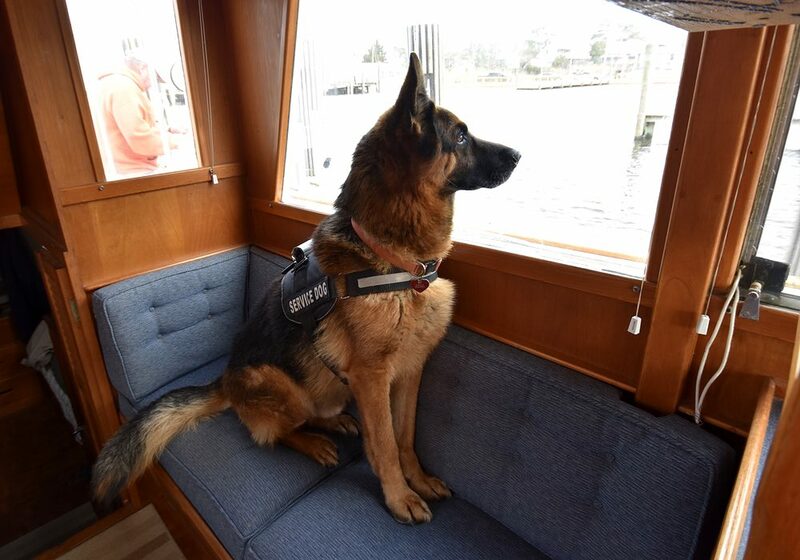 He has an AIS, an EPIRB, radar, everything he can think of to keep the boat safe. It’s a good thing, too. Will enjoys pushing his limits. Reicher, ready to go ashore. Take the first day on his boat. 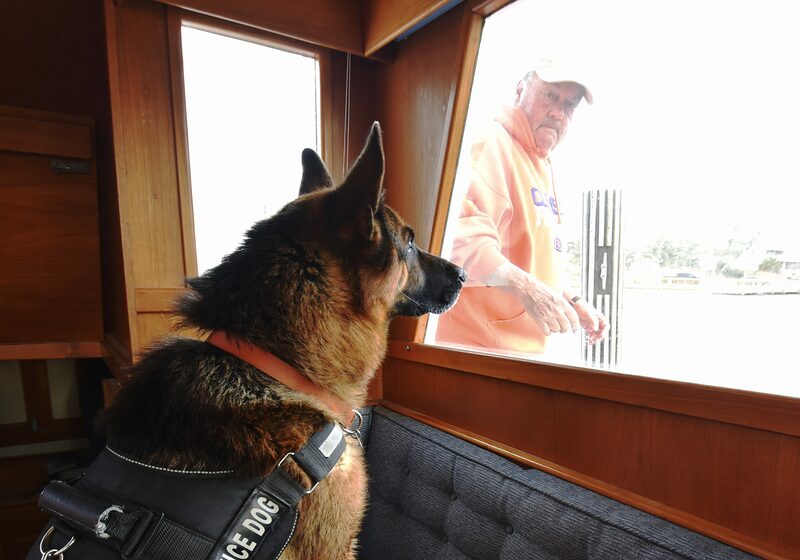 When he arrived at the marina in Plattsburgh, NY he noticed law enforcement at the marina. 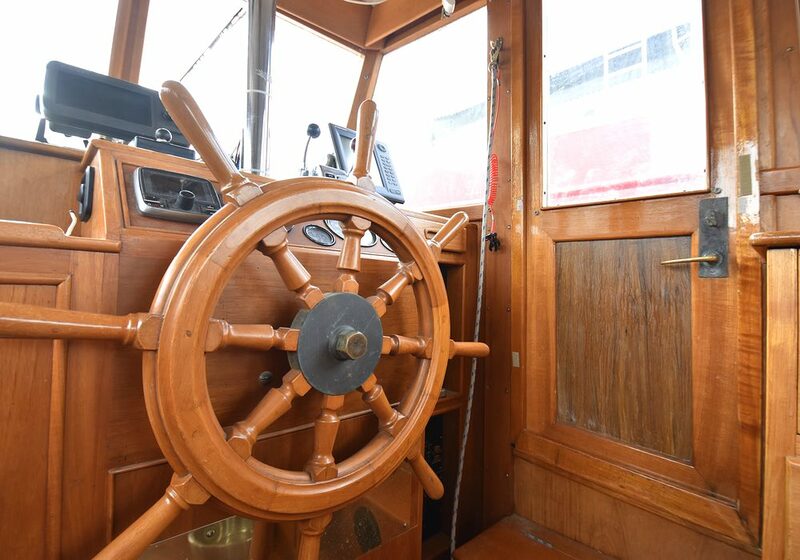 Being unfamiliar with the Grand Banks, and boating in general, Will set about figuring out the controls. He took less than an hour, then headed out to Lake Champlain. A call came over the radio for the Sea Glass. It was law enforcement at the Marina. A search was on for a prisoner, escaped from local lockup. Will was told to return to port for the search. The problem is that Will didn’t know where port was. There was no one on his boat other than Reicher. With that small adventure over, he headed north to the St. Lawrence River and to Canada, learning about boating on the way. Will keeps a statue of St. Francis, hung with photos of his previous German Shepherds. 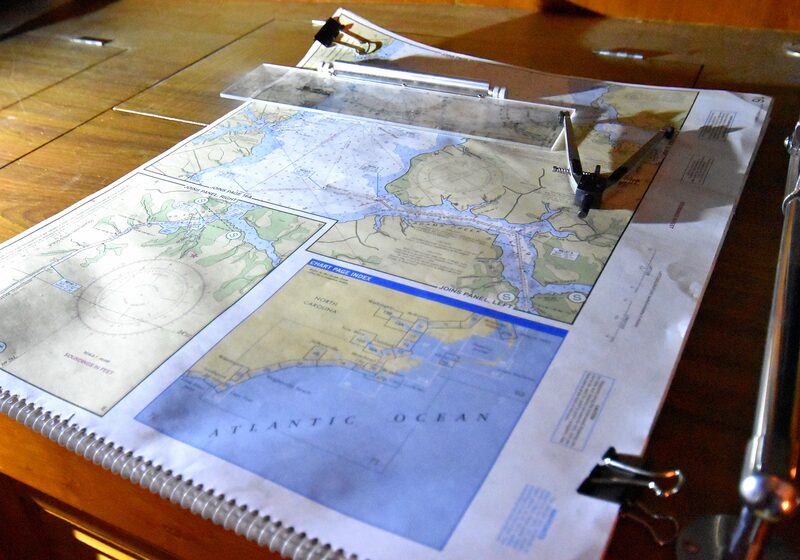 The necessary navigation equipment: plotter, paper charts, and a road atlas. 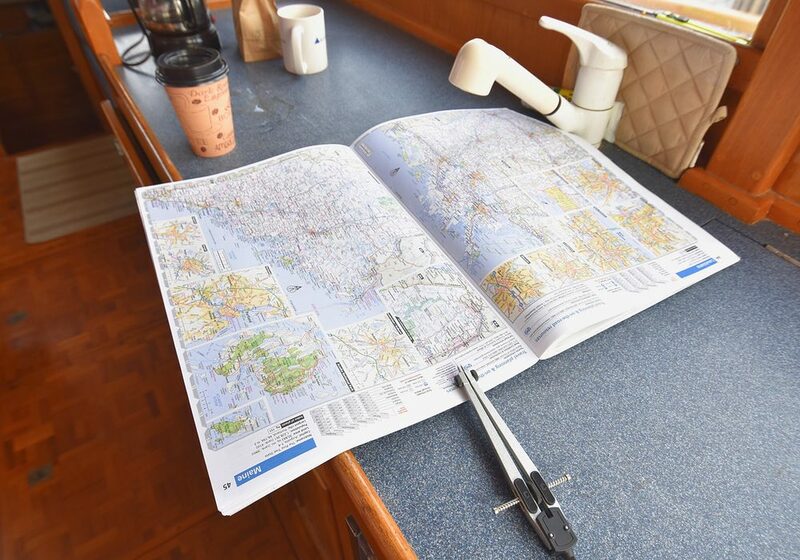 In addition to his Furuno plotter and paper charts, which he uses to navigate channels – Will also carries a Rand McNally road atlas. That’s where he looks for his next destination. From Labrador, the next stop seemed obvious: Greenland. “You ever get close to a state line and then just want to go across, to say you had?” The Labrador Sea was the proverbial state line. Will found a used bladder (tank) in a Labrador fishing village, put it on the forward deck and filled it with fuel, and set out for Greenland. When he arrived, he only spent a few days. He was more impressed by the icebergs, and the Greenland dogs which he said, “would eat Reicher alive.” That’s as far north as he went. After refueling, Will headed south for Prince Edward Island. Reicher keeps an eye on Will. Will keeps near the coast, and while in Canada, he stayed in the coves in and around Nova Scotia. One day he heard a distress call that had gone unanswered. The sailors were unhurt, but their rudder had been broken off when they hit an ocean sunfish. Just as he had stopped on the side of a road to stop a knife fight in North Carolina, Will set out to see if he could help. On the horizon, Will saw why there had been no immediate replies. He said the sailboat was huge, particularly compared to his trawler. It was a Morris 45 sailing sloop called Next Boat. Will rafted up with the sloop and began the journey back to land. 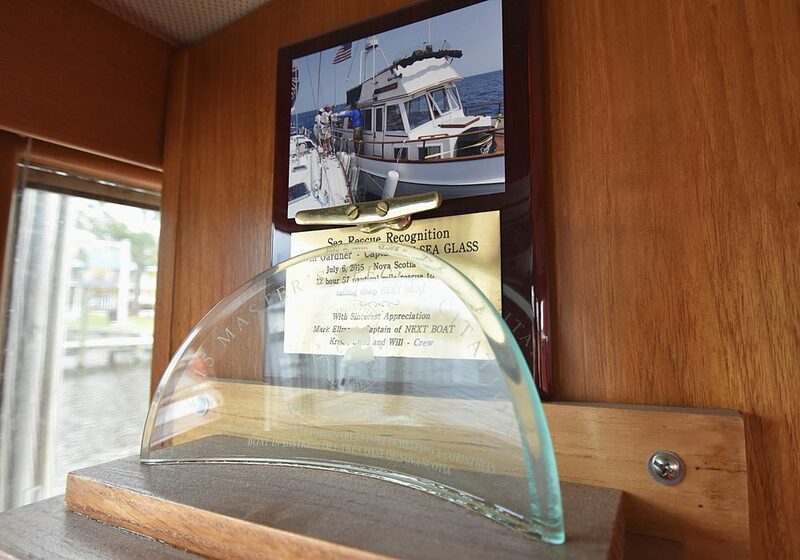 The crew’s New York sailing club honored Will for the 12 hour 57 nautical mile rescue with a plaque and a glass memento. 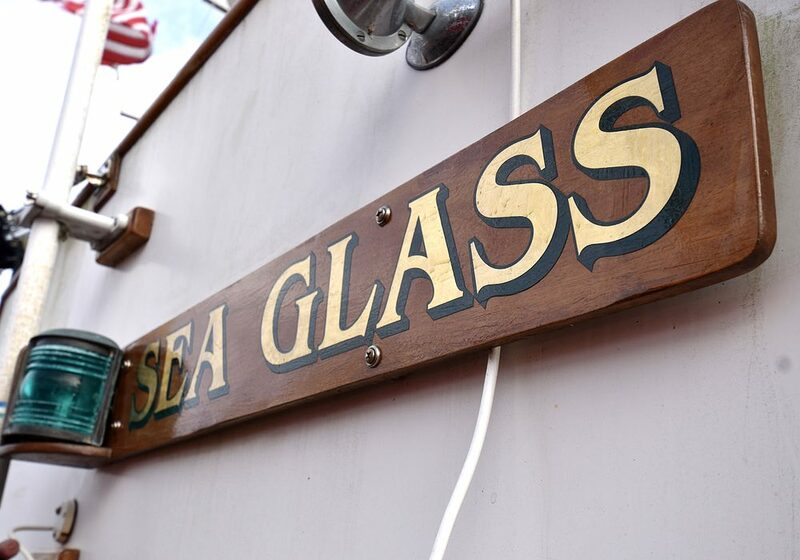 Etched in glass, are the words: In recognition of extraordinary effort in helping a Corinthian boat in distress off the Coast of Nova Scotia. Will says the rescue earned him a sponsored membership in The Corinthians sailing club. Will’s commendations for rescuing a stranded sailboat. 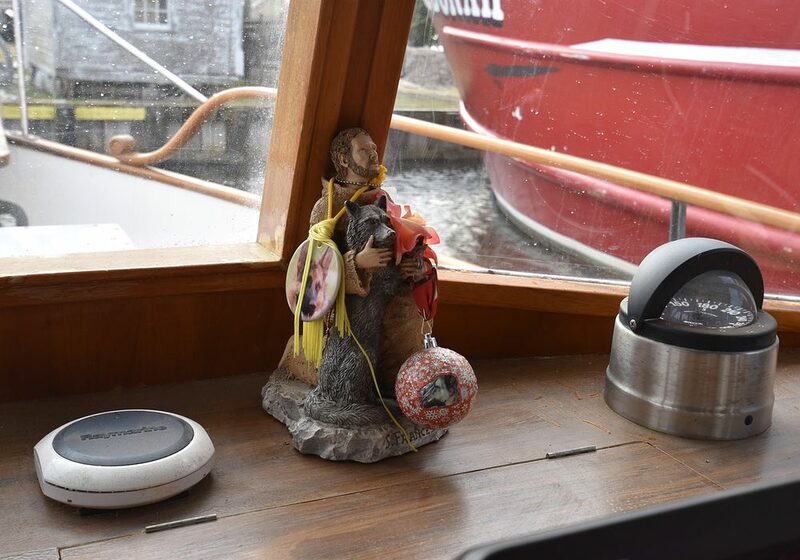 From a different encounter, he also earned himself a pink mooring ball in a Maine harbor. He had taken Reicher ashore for a break, and met a group of lobstermen. They became friendly, swapping stories and skills. They taught the novice how to dock his trawler. As he likes to travel the coast, the men put out a mooring ball just for him. A novice no more, Will has since earned his captain’s license. Will prefers the lamp light. He mentions mad dogs in the noonday sun and the importance of civility. 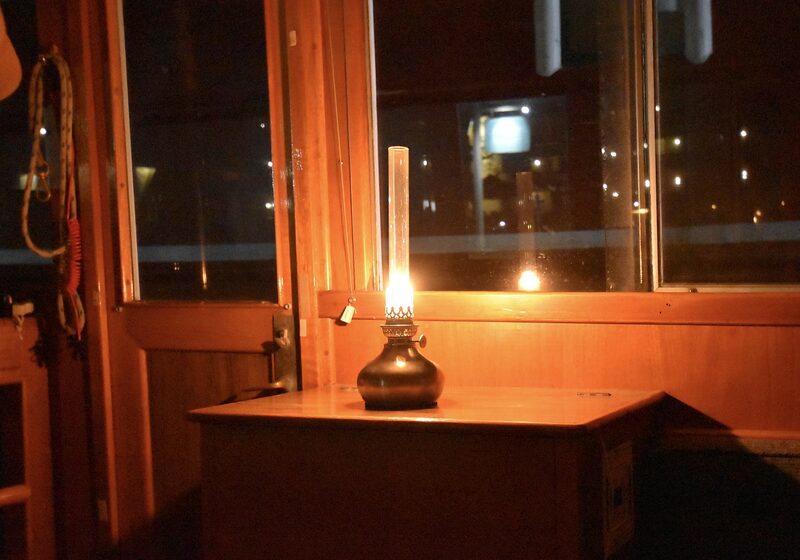 “If one’s going to wander, one wants to wander in a civilized manner.” The lamp and the teak, the way one looks in the light of the other, he says, is lovely. Will and Reicher stopped in Oriental on the way to Cape Lookout. They took in the beach and lighthouse on a cool day in February, and had it all to themselves. 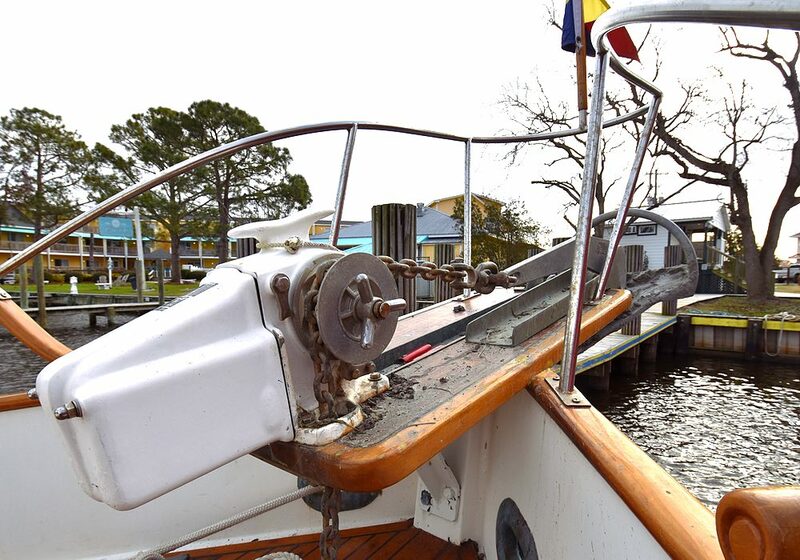 On his return, Will said they will head back to their permanent mooring in Elizabeth City. On his next trip, Will is considering heading back up to Maine, maybe further. He says Reicher prefers the cooler weather. So does he. The name has stayed the same from one owner to the next.